Indian-Spiced Chicken Curry | eat. live. paleo. We love Dutch oven/big pot dinners, especially in the winter when we crave a warm and hearty meal. Dutch oven/big pot dinners are also great for us because they make many meals at one go — and when your husband requires a lot of food all the time, as mine does, the abundance provided by a Dutch oven/big pot meal is a big relief. I recently came across a lovely recipe on the Bon Appetit website called Indian-spiced Chicken with Tomato and Cream. 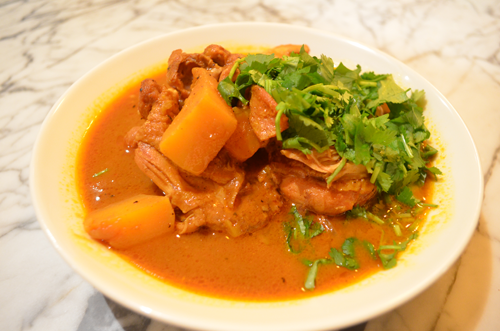 It’s described like a stew with curry-like spices, and it looked quite simple, so I decided to give it a try last weekend. I tweaked the recipe a bit — I used butternut squash instead of potatoes, chicken thighs instead of whole legs, goats milk yogurt instead of cream, added slightly more cayenne pepper, and garnished the curry with cilantro instead of mint (because I couldn’t find mint at the supermarket). The original recipe also instructed the ginger and garlic be grated, but I was too lazy and just minced them finely (which works just fine, because they will cook down anyway). The resulting stew/curry was FANTASTIC!!! It is the first curry I have made from scratch (i.e. not using a ready-made paste), I was so impressed with myself! 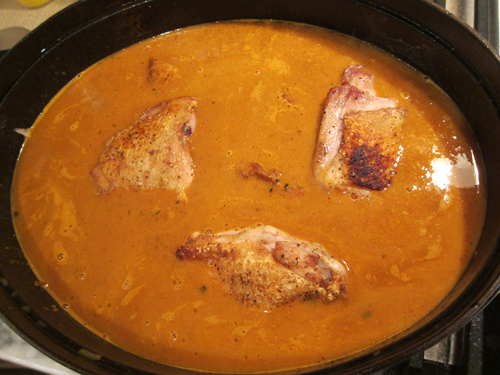 If you are craving a good Dutch oven/big pot meal, or a simple curry, this is a great recipe. I will definitely make it again. 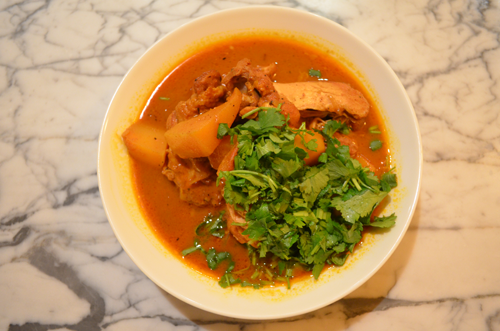 The layers of flavors from the spices are wonderful, perfect for a cold winter night. Next time, I may use coconut milk instead of goats milk yogurt… but I think my tweaking worked out very nicely. The sweetness of the butternut squash complemented the spiciness very well; we also loved that the squash is lighter than potatoes. The cilantro was great, too, although mint would have been interesting — maybe next time! All in all a great new recipe to add to the repertoire. It’s a slow-cooking kind of meal and takes a few hours to make, so it’s not ideal for a weekday dinner. But it’s definitely a great meal to make on a weekend, and it will feed you for a few days! Also, your house will smell amazing with all the spices involved. Here is the recipe, adapted from the Bon Appetit version. 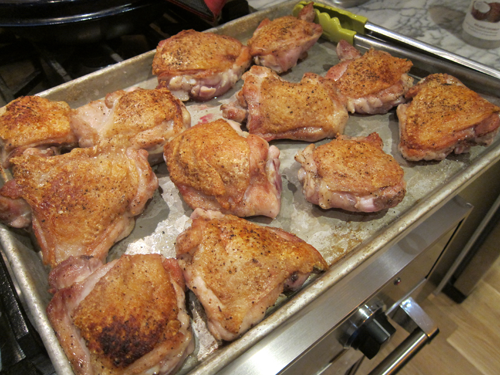 I doubled up the amount of the original recipe because I wanted to make a big batch. If you are not as big a eater as my husband (few are), you may want to halve the recipe. Or, just make it as is and enjoy leftovers! The curry tastes even better the next day. 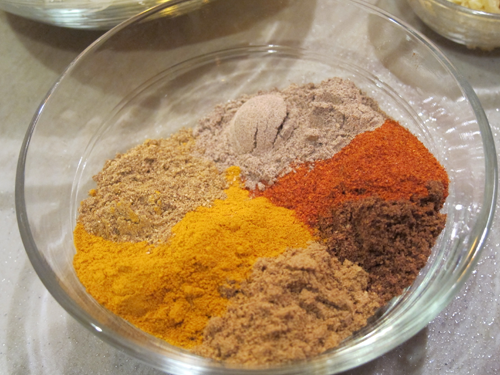 It’s a good idea to have all the ingredients neatly measure out before you start, especially the spices. Heat the ghee in a large Dutch oven over medium heat. 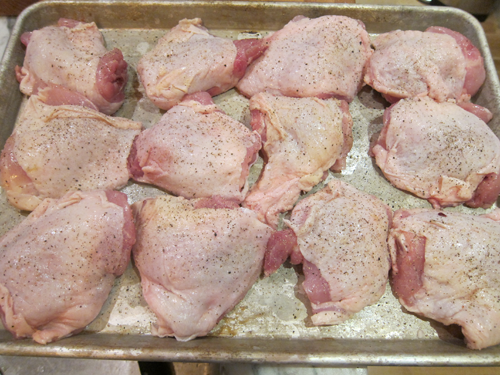 Working in batches, cook the chicken, skin side down, until golden brown, about 7-8 minutes. (You don’t need to turn them.) Set aside. There will be a lot of oil left in the pan, and you may want to drain some of it out (I did). Add onion, garlic, ginger to pot and cook, stirring occasionally, until onion is very soft and golden brown. 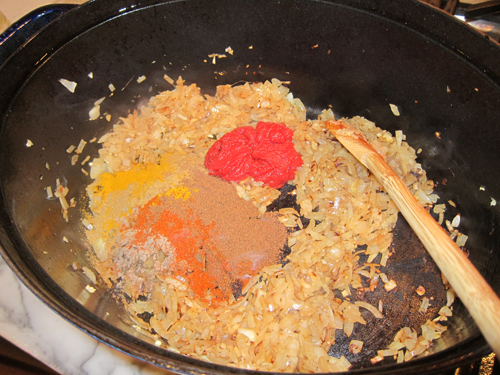 Add tomato paste, garam masala, cumin, tumeric, coriander, cayenne, cardamom and cook, stirring often, until tomato paste begins to darken, about 4 minutes. 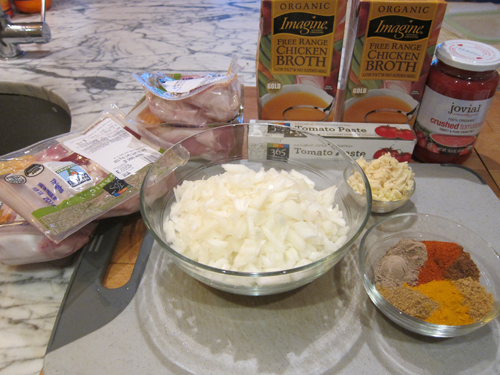 Add chicken, broth, tomato puree, and goats yogurt to pot. Bring to boil, reduce heat and simmer, partially covered, skimming occasionally, until chicken is almost falling off the bone and liquid is slightly thickened, about 2 hours. Add the butternut squash and cook, partially covered, until the squash are fork-tender and the liquid is thick enough to coat a spoon, about 45 minutes. Season stew with salt and pepper. 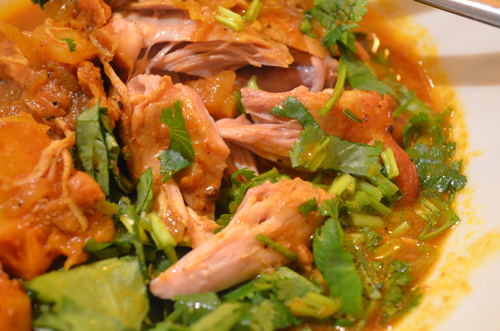 Serve in a bowl, garnish with cilantro. The chicken is fall of the bones tender — SO GOOD. We made a little bit of rice to go with the curry, and we must say, it was awesome. We rarely eat rice, but on this occasion, it was worth it. Thank you Thank you……I finally get to use my garam marsala spice that I found on sale. Have never used that spice before. Wonderful recipes here !!! Thank you, thank you !! I finally get to use my garam masala that I bought on sale !! Keep the wonderful recipes coming !! When I cook a recipe I post it to my FB page with a share back to your page !! Thank you! Been off the blogging wagon but hoping to get back on for the holiday season!